HORSE COUNTRY is an absurdist love affair with words that begins as the banter between Bob and Sam, two seasoned comedy pros, but quickly becomes a relentless, ravenous examination of our behaviour, values and beliefs. As they slump at a table littered with the detritus of consumerism, their discussion ranges from card games to fishing trips to talking seal acts, and yet everything this hilarious yet ominous duo touch on takes on a deeper and more urgent meaning as the play seeps beyond the edge of the stage. C. J. Hopkins' heavily existential text takes on themes of genocide, despair, abuse and brutality, leavened with boredom, geniality and humour. Horse Country is destined to become a classic of early 21st Century theatre; a complex and provocative snapshot of the time when global capitalism emerged as the single most powerful force in the world, and we are just waking up to the realisation of a supremely hollow victory. Directed by John Clancy (Also directed AMERICANA ABSURDUM, GONER, THE COMPLETE LOST WORKS OF SAMUEL BECKETT... & CINCINATTI), David Calvitto (also of GONER) and Ben Schneider (also of THE COMPLETE LOST WORKS OF SAMUEL BECKETT...) team up as Bob and Sam in this unsurpassed comic theatre ritual that has propelled Hopkins into the top ranks of contemporary American playwrights. 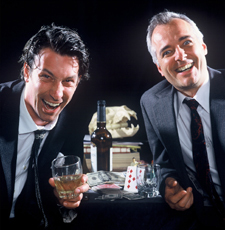 In 2002, John Clancy and Guy Masterson presented Horse Country at the Edinburgh Festival where it quickly emerged as perhaps the finest new work on the Fringe winning The Scotsman Best Of The Firsts Award. January 2002 it returned to Edinburgh to open a full UK tour at the Traverse Theatre. It opened in London in rep with THE COMPLETE LOST WORKS OF SAMUEL BECKETT at the Riverside Studios for 6 weeks closely followed by presentations at the World Stage Festival in Toronto and The Brighton Festival. In 2004 it toured to Australasia and Hong Kong - among other destinations.